This page gives you a quick overview of recent changes. Take a look at our Package Design tools, things are progressing very well. I have found something great and you must give it a go. Dropbox is a website that gives you a place to store data. It's as easy as copying files on your own system. I find it most useful for sending big files so you can now find my articles and out latest program downloads in my Dropbox folder. It's been a while since my last update. I have been working on a big contract job for Chris Dale Spiral Systems. Chris makes a spiral cooler that can be adapted for just about any product and any temperature range. The bread companies seem to love him because the Dale Spiral Cooler can be found at most bakeries. My program does the complete design. Pick a product and specify the temperature. The program will size the spiral drum, the fan, the coil and even create a provisional price. How do you locate a problem on a refrigeration system? Yes, I'm on that question again. Actually, as long as you take the right readings, it's not that difficult. 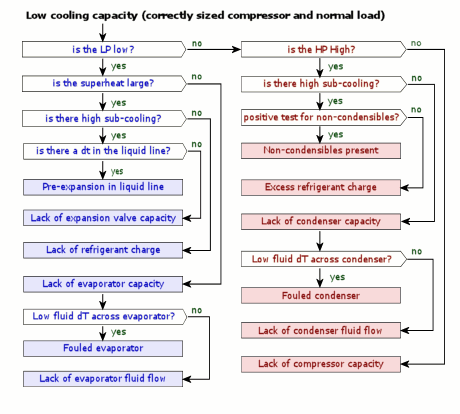 What you have to understand is basic refrigerant logic. I have just released a new program called RefDiag that tries to identify the fault for you and while it is in beta release, you can download it and use it for FREE. But still, there is no substitute for the human mind in solving complicated problems. Next, look at the log book. What was the last repair? Before diving in with your tool, think about what you have just heard. There is a good chance that the information from the owner and the log book could lead you to the cause. Look at the filters for signs of lack of maintenance, look around the pipe system for signs of oil, look at the compressor oil sight glass, check the liquid line sight glass, look at the fan belt for break or wear, look for frosting on the pipes (especially at the expansion valve outlet and suction port). OK, once all of the obvious things are out of the way, you now have to connect your gauge set. The suction and discharge pressures alone are not enough. You must measure the temperature on the suction line at the expansion valve bulb and the liquid line temperature at the condenser outlet. These line temperatures are so important, I am always surprised to see that the surface temperature gauge is not that common in the refrigerant maintenance toolbox. Measure the on-coil air temperature to both the evaporator and the condenser. What is the gauge pressure? Hold on... The gauge pressure does not control heat flow, it is the temperature. Instead of asking about the gauge pressure, we should ask "what is the temperature". Depending on the refrigerant in the system, you will need to determine the bubble point and the dew point for both the suction and discharge gauge pressures. "do we have a HP (high pressure) or a LP (low pressure) problem". If the condenser bubble point is much higher than the ambient air (say more than 20°C), then you have a HP problem. If the evaporator dew point is much lower than the return air (more than 20°C), then you have an LP problem. Now measure the superheat. The purpose of the expansion valve is to regulate refrigerant flow so that the superheat at the bulb is maintained at 7.5°C. If there is a high superheat, then the evaporator is not getting enough refrigerant. So, where is the refrigerant? If the sub-cooling is high, then there is a pressure drop in the liquid line. Check for temperature drops across the sight glass and the filter drier. The best is to measure the temperature drop from condenser outlet to expansion valve inlet. If there is a temperature drop, then you have found the problem. It is pre-expansion in the liquid line. If there is no temperature drop in the liquid line, then it must be an expansion valve fault. If the sub-cooling was low, then there is a low charge. Notice that we didn't just jump to this fault, it is a combination of low LP, low sub-cooling and high superheat. You might also see bubbles in the sight glass but remember, this is not the only reason for this symptom). What if the superheat is low? This means that the evaporator is getting enough refrigerant but does not have enough capacity for the system. This could be caused by a lack of airflow or the evaporator could be fouled. This is easy to check. Is there a low air temperature drop across the evaporator (less than 6C)? Yes, then the evaporator is fouled. A high air temperature difference (more than 10C) means that there must be a lack of airflow. Could be just dirty filters or maybe a slipping fan belt. Now measure the sub-cooling. As you add refrigerant to the system, it moves to the condenser where it is condenser to a liquid. The expansion valve allows only the refrigerant flow needed to maintain superheat to pass through and so any excess refrigerant will remain in the condenser. Adding more refrigerant to the system will simply add more liquid. What happens here is that the liquid is now backing up in the condenser and taking up valuable condensing area. In order to achieve the necessary heat transfer, the condensing temperature rises. Hence the HP problem. The liquid in the condenser is now cooled more than it should (more than 7°C). So, the high HP with the high sub-cooling means overcharge? Not entirely, you need to check for non-condensables before concluding that there is an over charge. If the sub-cooling is normal (4°C to 7°C) there must be a lack of condenser capacity. Check now for a low air temperature rise across the condenser (less than 5°C). This would mean a blocked condenser. If the condenser air temperature rise is high (more than 10°C), then there is a low condenser airflow problem. Check the fan outlet, speed controller or maybe a plastic bag across the condenser hail guard. This means a lack of compressor capacity. It could just be that the load is excessive! If not, there may be a fault on the compressor. Below is a very nice diagnostic tool that comes from Patrick Kotza's excellent REFREPAIR manual. Call me to get the free demo CD and learn something worthwhile about refrigeration systems. Let's face it, training is a problem in South Africa. We have many start up companies and plenty work. The difficulty is to find refrigeration people who are actually able to locate problems. I have yet to find a better way to learn refrigeration logic than the Kotza training program. The program tracks your progress and takes you through all the theory you need to be able to find ANY problem on a faulty refrigeration system. You can repeat the course as many times as you need and you can do it without disrupting your normal working day. All refrigerant based programs have been updated to include the new refrigerant library. Thanks to Tony in Hong Kong for feedback on the site measurements of a R407C cycle. Our new PipeNet program is almost ready for release. Check the downloads page soon for a fully functional evaluation release. Some of this work is already starting to bear fruit and you will see the results in our new program releases. Many of the items are related to web page design. The reason is that it provides amazing flexibility in report and data presentation. Mollier Chart includes over 140 refrigerants so that you can easily evaluate the system performance. I have found that the Refrigeration-Engineer forum to be an amazing source of information. If you haven't tried it yet, give it a go. Log-on, register and start asking questions. you will be surprised by the response. We are finalizing the release of our PipeNet program. This is not just an update of PipeFlow, it now has a full graphical interface where you can build a network. In addition, the program calculated the index run for you. Please help me to find it. The book is out of print and not available from Amazon or any of the other on-line book shops. Maybe you have a copy on your bookshelf and don't need it anymore. After the end of year break, I am still finding it hard to stay working for the full day. During the holidays, I spent some time on improving my refrigerant library. For the full list, try my MollierChart program. You will now see over 100 exotic refrigerant blends along with the common omes. Of course, these new refrigerants automatically become available in RefSim, LineSize, CondUnit, aPac, MollierChart, Coil Simulation, CapTube. I have also improved the MollierChart controls to make it easier to compare refrigerants. Plenty has happened since our last update. There are new versions of many of the programs, mostly small fixes and improvements. Our RefSim program now includes a professional htm style report. The DuctNet program now has an detailed network diagnostic and an XML import/export function. Bruce has been doing research on coil performance and will be reporting some interesting findings soon. We are also happy to announce that TechniSolve has been awarded the agency for the FrigoSim program. This is an advanced package that allows you to design any thermal system. Nick of NF Engineering in South Africa has been giving me some good feedback on the DuctPricer and QuickDuct programs. Look out for an update in the next few weeks. Patrick Kotza has provided some good prices for the latest refrigeration training products. I would advise you to take advantage of the special package deal NOW. Version 2 of the SAIRAC Technical Data CD is due for release in August 2006. At the member price, this is a deal that you would be crazy to miss. The Capillary Tube selection program has been updated thanks to information supplied by Jeff Jaffer from Canada. Mark Setaro has prompted us to add a minimum air velocity to the static regain method in our DuctNet program. Thanks Mark, it is with your positive feedback that our program is improved. Like the new web site. I'm experimenting with CSS (thanks Charles Wyke-Smith, your book has been a great help) so you can expect some improvements here. Check out the new PeakLoad program. It now includes the peak time calculation. The Room Heat load calculator also has been revised to make data input easier. Also, take a look at the Technical Data Manual. It's a bargain for what you get. Our DuctNet has also had some major improvements thanks to the feedback from Dr Alec Johansen and Mark Setaro. New program released. CableSize. Now you can size the electrical cable with the same comprehensive software programs that you have come to expect from us. Thanks to Dieter Bucher for the great information. I have re-introduced the version table. The idea here is to keep you up to date on our latest releases. Soon we will be issuing the latest update of our RoomHeat program. There are too many changes to discuss here but the main focus of the update is to make data entry easier. Thanks to the encouragement of John Kidd of YORK International, we have added some new refrigerants to our library. You can see these in the MollierChart program. We have written some software tools that have been included for FREE on the SAIRAC Technical Data Manual CD. For the amount of technical data, the CD is a good buy at R500 (South African Rands). The software tools include psychrometric chart plotter, wall heat transfer coefficient calculator, duct fitting viewer. If you would like to get a copy of these tools, send me an email request. There has been some big improvements to our COIL designer range and the REFSIM Refrigeration Cycle designer. The coils now have step-by-step simulation to show the actual air and refrigerant temperature path. If you have not yet seen the KOTZA Refrigeration Training Software, you don't know what you are missing. We have now sold a number of copied in South Africa. We have been appointed as the South African agent for the Kotza Refrigeration Training program range. This is an impressive self help trainer that will take you from the basics to diagnosing advanced systems. Dr Alec Johannsen has agreed to include his Heat Load program (BSIMAC 7.0) on our web site. Future versions will incorporate links to our Psychrometric graphics and our equipment designer tools. We hope to do some development work together in the future. All of our programs are being updated to include a powerful unit converter engine. This will allow you to change the units of any value to suit your needs. The ColdRoom program has just been completed and will be ready for download next week. Registered users will be able to download the updates for free. This has taken some time. For the last six months since my last update, I have been working on the new South African Institute of Refrigeration and Air Conditioning (SAIRAC) Technical Data Manual. Essentially, it is a reference source for all information related to the field of HVAC&R. Take a look at www.sairac.co.za to see what it's all about. The TechniSolve software range has also been revamped. Thanks to Koos Uys in Bloemfontein and to the engineers Spoormaker & Parthers for some great feedback. Some corrections were made to the MollierChart program. I'm still not fully satisfied with the 2-stage system. How about some feedback. Plenty small changes, mostly to fix WinXP problems, so we decided to make a complete update. The coil programs DXC and CWC have been improved considerably. Thanks to Koos Uys for some valuable feedback in the DX coil solution. The ACSpec program has been improved and good news, it's FREE. So, get a copy and use it for your work with our compliments. Thanks to John Kidd of YORK International for improvement suggestions to MollierChart. This now includes the 2-Stage vapor compression cycle. You will see that we have updated all the programs. This a because we revised some of our low level routines that has needed a rebuild. We have also improved the RoomHeat data file format. We have corrected a bug in the load routine of the ColdRoom program. Please download the new version. If you have been waiting for our new duct designer, there is some good news. The beta release will be available for download in July 2003. Our teaching tour through Canada has proved to be very successful. In the process, we have used our software to illustrate some of the theory of airconditioning and refrigeration. This has also resulted in a number of suggestions from the delegates so you can expect some new releases. The first of these is in our DuctMate calculator. We have improved the entry selection option to accept any of the duct dimensions. Thanks to Jan Tuszynski in Toronto for finding this one. Peter Allen of RTS Design has pointed out a snag in the new ColdRoom release. When you install the program, we overwrite the database. This means that we write over any changes that you may have made to your database. As long as you know about it, you can back up the data before installing the new version. We have fixed this problem in the version 3.080 release. Thanks to RTS for pointing out the problem. If you have reached this page than you must know about our new website. What a task, I never expected so many links that needed to be updated. We will soon be releasing new program versions to update the website links. In the meantime, we will keep the old web site active as it gets phased out. Hennie Traut from AirTech has pointed out a problem in RoomHeat. If you put too much fresh air into a room, the auto design calculation has a problem balancing the psychrometrics. For now, I have put in a check and a manual reset but it still needs some attention. The new World Locations Database is now up and running. Get a copy and try it out. We have received many requests for the old DutyCalc program, so we have now upgraded this to Windows. Try it out and let us know what you think. We are planning to release our new duct designing program early next year. This will have full graphic facilities and allow you to automatically design complete ducting systems. PipeFlow now saves the pipe specifications in an external database that can be revised by the user. Thanks to Dusan Stefanov of ACDD for suggestions. LineSize has been revised to give complete freedom of manual override selection. Thanks to Paul from Société Cifroc in Morocco for some very useful suggestions. Mollier and LineSize now includes the new R22 replacement refrigerants R407c and R410a. Thanks to DuPont for the source data. Fluid property units have been corrected thanks to Barry Green of RTS Design for noticing the detail. Correction made to the Room setpoint button of RoomHeat. Correction made to the fresh air temperature field in ColdRoom. PipeFlow has been updated to cater for pipe diameters up to 750mm. We have also improved the way that the price database is stored. If you have been using the pricing facility and would like to convert your data, please send us an email. Thanks to response from our users, we have found that some of the input forms are not clear with large fonts selected. We have gone through all programs and hopefully corrected all the problems. DuctPricer now includes user defined types. All programs have been updated for Delphi6 and WindowsXP. In the process, we have changed our setup.exe to produce smaller and cleaner setup programs. There have been some minor program changes as well. LineSize now allows evaporating temperatures down to -60degC. All main program tool buttons include text to make clearer. PsyChart dry bulb scale has been modified. DuctMate has been revised to exclude references to existing products. Have a look at the Refrigeration Equipment Selector added on 7 March 2002. Finally for our European users. All programs have been updated to fixed the decimal separator problem. We have recently developed a new range of refrigeration tools. These include ColdRoom load calculator, Mollier Chart, Refrigerant line sizer, Product cooling time calculator. For more information, visit our Refrigeration page. Users from Europe have pointed out that some of our programs fail to start due to the regional settings. In Europe, the decimal and thousand separator are reversed. We still need to find a suitable solution for this problem but in the mean time, just set the decimal separator to '.' and the thousand separator to ','. All programs have been updated to correct the email support with Outlook Express. We have made significant improvements to DuctPricer by adding a syntax hilighter and incorporating statistics management. An error in the PipeFlow program price estimate has been corrected and the reporting of the price estimate has been enhanced. PipeFlow has been updated to include a price estimate report. DuctPricer & QuickDuct have been updated. We have made significant improvements thanks to the feedback from our users. The most important of these is that you can now override the automatic flange selection. We are currently building some expert systems into our duct pricing program. What we are doing is incorporating a statistical editor that will allow you to use reliable history data for quick duct pricing. This will also allow us to implement automatic error detection into your normal DuctPricer use. We are currently developing a building room load calculator. The emphasis here is on simple input with clear and accurate answers. Many of our current ColdRoom users have asked for a Windows version. We are happy to announce that this work has started. For the present, we are still supporting the DOS version that you can download from this site. If you buy the DOS version, you will qualify for a reduced price upgrade to Windows.